Golkonda, also known as Golconda, Gol konda (“Round shaped hill”), or Golla konda, is a citadel and fort in Southern India and was the capital of the medieval sultanate of the Qutb Shahi dynasty (c.1518–1687), is situated 11 kilometres (6.8 mi) west of Hyderabad. The Golkonda Fort used to have a vault where once the famous Koh-i-Noor and Hope diamonds were stored along with other diamonds. During the Renaissance and the early modern eras, the name “Golkonda” acquired a legendary aura and became synonymous for vast wealth. The mines brought riches to the Qutb Shahis of Hyderabad State, who ruled Golkonda up to 1687, then to the Nizam of Hyderabad, who ruled after the independence from the Mughal Empire in 1724 until 1948, when the Indian integration of Hyderabad occurred. 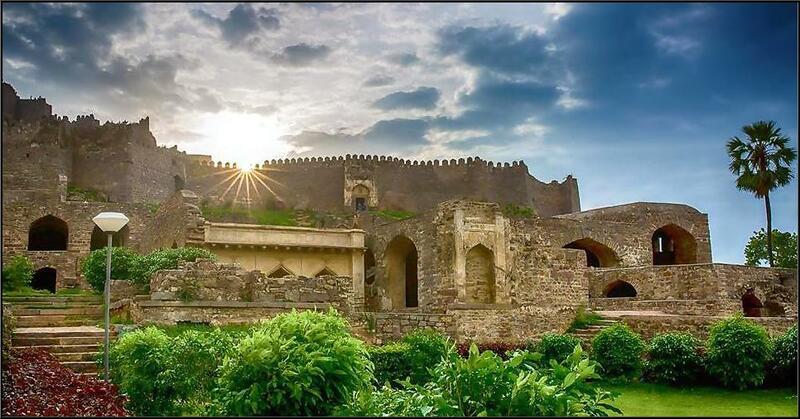 The Golkonda fort is listed as an archaeological treasure on the official “List of Monuments” prepared by the Archaeological Survey of India under The Ancient Monuments and Archaeological Sites and Remains Act. Golkonda actually consists of four distinct forts with a 10 km long outer wall with 87 semicircular bastions (some still mounted with cannons), eight gateways, and four drawbridges, with a number of royal apartments and halls, temples, mosques, magazines, stables, etc. inside. The lowest of these is the outermost enclosure into which we enter by the “Fateh Darwaza” (Victory gate, so called after Aurangzeb’s triumphant army marched in through this gate) studded with giant iron spikes (to prevent elephants from battering them down) near the south-eastern corner. 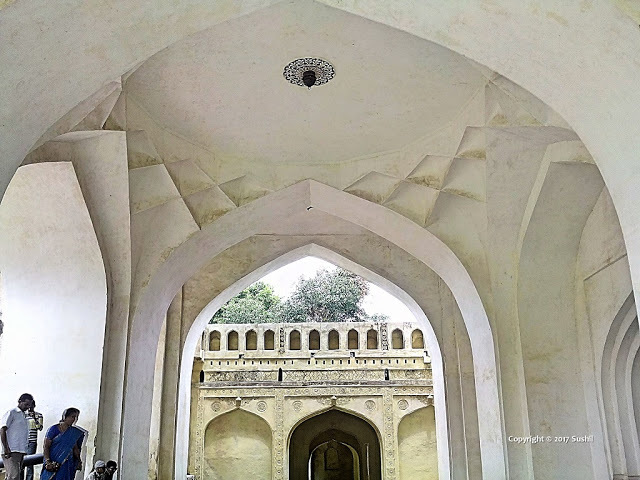 At Fateh Darwaza can be experienced a fantastic acoustic effect, characteristic of the engineering marvels at Golkonda. A hand clap at a certain point below the dome at the entrance reverberates and can be heard clearly at the ‘Bala Hisar’ pavilion, the highest point almost a kilometer away. This worked as a warning note to the royals in case of an attack.